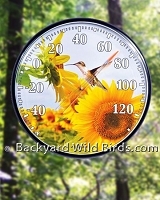 Attract Hummingbirds with Deck, Pole and Window Hummingbird feeders. 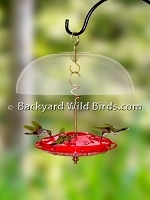 Hummingbird Ant guards come built in or external to protect Hummingbird Feeders nectar. Hummingbird Domes shield the hummingbird feeder from the sun and rain. 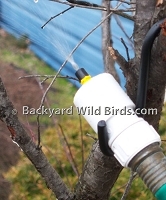 This can aid the hummingbird nectar to stay fresh and last longer. Deck Pole Hummingbird feeders are an exciting way to see Hummingbirds when they come to have a sip of nectar and you are sitting on your deck. Window Hummingbird feeders bring the Hummingbirds up close and give great views of the amazing Hummingbirds. Need help? See our Hummingbird feeder tips and ways to Attract Hummingbirds To Feeders. 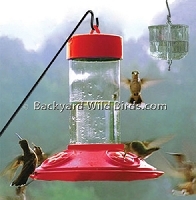 Very popular Best 1 Hummingbird Feeder with 8 feeding ports and an invaluable ant guard above to protect the hummingbird feeder. Blown glass diamond ruby hummingbird feeder is handcrafted blown glass hummingbird feeder with a solid copper base with 8 flower pattern openwork feeding ports. 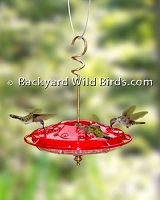 Deck Pole Hummingbird Feeder is a Hummingbird feeder and deck pole arm combo. 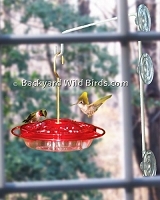 Hummingbird feeder 32oz is a bright red feeder with 10 yellow feeding ports and includes built in ant moat. 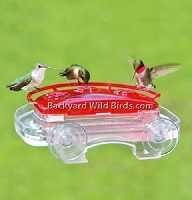 Clear Hummingbird Feeder Nectar is instant hummingbird feeder solution just for Hummingbird feeders. 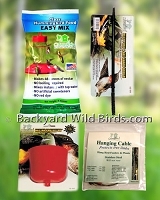 Hummingbird Feeder With Deck Pole is a Hummingbird feeder and deck pole combo. Hummingbird feeder has 7 feeding ports and a built-in ant guard on top. 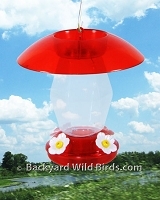 Hummingbird Feeder With Dome has a big, red dome roof that attracts hummingbirds! Hummingbird Feeder Roof is rain guard, sunshade and ant guard all in one. 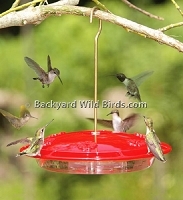 Hummingbird Feeder With Pole is an ideal size for a garden Hummingbird feeder with 3 ports and built in ant guard. 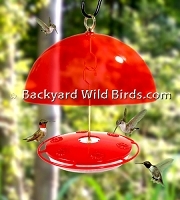 Hanging HummZinger Excel Hummingbird Feeder with large 16 oz capacity and no waiting 6 feeding ports. HummZinger Little Fancy feeder is an extraordinary good hummingbird feeder with a built in ant guard. Said to be the BEST Pest Free Hummingbird Feeder EVER! 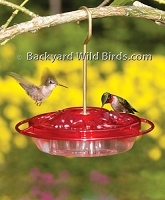 The Hummingbird feeder has a unique 2 piece base with innovative flow-control design to keep nectar from sloshing at ports. Ant, Bee and wasp resistant. 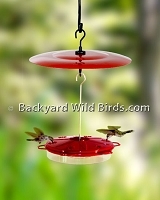 Popular Hummingbird Feeder with essential Red Ant Guard above built in. 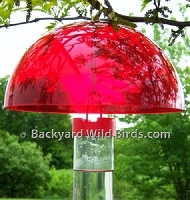 This favorite Hummingbird feeder really attracts Hummingbirds to its red color feeder. 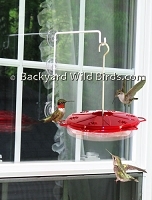 Popular Window Hummingbird Feeder with window mount hook is just right to bring lots of Hummingbirds to your window. Has 6 ports, built in ant guard and saucer design to keep ants and bees away. 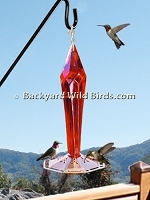 Beautiful Ruby Glass Hummingbird Feeder with copper top is great on a deck pole. Hummingbird Feeder has 3 ports and holds 16 ounces. Hummingbirds love it!